So I just got done writing a huge article on EMF protection clothing, and while I was researching it I came across anti radiation blankets. I think these are a really smart product, that make a lot of sense and can really work for certain people and situations, so I wanted to develop a buyers guide. First of all, there are quite a few products out there, but it’s hard to know what to look for, or to understand how well a product will work. When you’re considering buying a product like an EMF protection blanket, the quality of the protection is really important, so first let’s talk about what to look for, and how to understand if a product is actually reducing or blocking radiation. When you’re looking for products that block, shield, or reduce radiation, it’s important to get the absolutes out of your mindset. Rarely do materials that aren’t pure metal, block 100% of EMF radiation. So instead, think in terms of the level at which these materials, like a blanket, reduce the radiation. This is described with the term attenuation. In physics, attenuation is a materials ability to cause a gradual reduction in force as energy passes through it. For example, the tinted windows on your vehicle attenuate sunlight, the walls of your office attenuate sound, and the lead vest you wore at your last dental appointment attenuated the x-rays. Metals like mylar, copper, aluminum, attenuate EMF radiation by absorbing, or scattering the photons as they pass through. 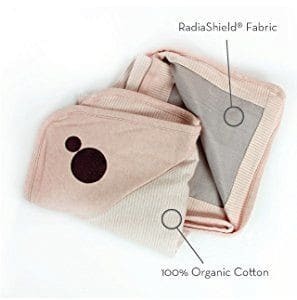 So usually when your shopping around for products that reduce radiation, like an anti-radiation blanket, you’ll often see metals (usually silver) weaved into the fabric to block this radiation. When you’re looking at the packaging or description of a product, you’ll see this attenuation displayed with the measurement decibels (dB). Take a look at the chart below and you’ll better understand how this measurement displays a materials ability to reduce radiation. 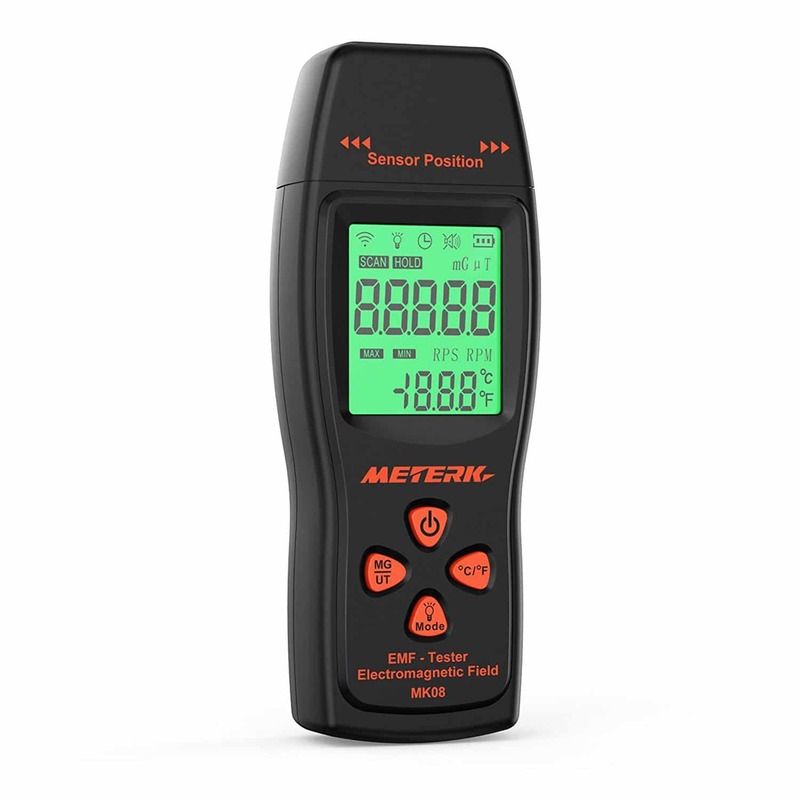 One of the products I’ll talk about below, for example, lists that it has an attenuation rating of 38 decibels, which you can see from the chart would be approximately 99.98% affective. There are plenty of good reasons to use Anti Radiation blankets, but probably the most common is women who are pregnant, or for babies or young children. I just ordered a blanket for my little girl after doing the research for this guide, you can find the one I chose down below. So now let’s look at a few of the best EMF protection blankets out there and talk about each little bit, then we’ll talk a little bit about a few of the things to watch out for. There are quite a few blankets out there, so after doing quite a bit of research these are the ones I liked best and the reasons I liked them. Ok, so I actually just bought this blanket for my daughter, because I absolutely love it. Go take a look at the listing on Amazon real quick. First of all, unlike a lot of anti-radiation products, it’s actually really cute. But more than that, it’s actually been thoroughly tested, like many of SYB’s products at an accredited lab, and has a fantastic attenuation rate of 38 dB. If you remember from up above, this is almost 99.99% effectiveness. Anti Radiation baby blankets are such a great idea, because children are so vulnerable to EMF radiation. Whether it’s a baby monitor, or a tablet you use as a sound machine, or your cell phone while you’re holding them, having a layer of protection can do wonders for protecting your baby. The cool thing about this baby blanket, and another reason I purchased it, is that it has two outer layers that are just hypo-allergenic cotton, and a middle layer that is spun with silver that makes up the attenuating layer to actually provide the protection. This blanket in particular is actually made of 18% silver, which is pretty wild. Their Amazon listing has a ton of information and some great reviews if you want to check it out. Belly Armor is, in the small world of anti-radiation products, a great brand. They have been around for quite a while and make some fantastic products that are very well reviewed. This blanket (see the listing here) has amazing reviews, and would make an amazing gift for a soon-to-be mom. It’s intended to protect the belly of a pregnant mom from the constant bombardment of EMF radiation all around us, but if you take a look through the reviews you’ll see that people use it for all kinds of things. 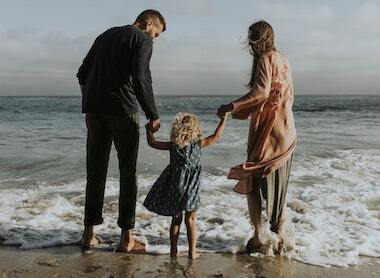 Many of the parents have ended up buying several, as the first one they continue to use as a baby blanket, or to protect there children while they are on their phones or iPads. They don’t list the decibel rating, but say that the blanket blocks 99.9% of radiation which means the rating can’t be less than 30 dB which is really good. This blanket is made of two layers, the first layer being organic cotton and the second made of RadiaShield, which is a silver-lined textile that actual forms the blocking material, but is still breathable and machine washable. You can see this Belly Armor blanket tested using an EMF meter in the video below to see just how well it works. This is another blanket that I really liked, and I wanted to write about it because it does have one key difference. Most EMF protection products, like blankets, use fabric that is lined with silver. The ShieldGreen blanket uses a stainless steel mesh fabric inside to offer similar levels of protection. The Amazon listing claims 99.99% reduction, and that the blanket is made of 41% cotton, 34% polyester, and 25% Eco-friendly stainless steel fibre. (Best Recommendation) Or, if you’re looking for an even more detailed guide I’d check out Nicolas Pineault’s “A Non-Tinfoil Guide To EMFs” (This one does cost a few dollars, but is a fantastic book). After you’ve read through a few of these you should have a pretty solid understanding of how to reduce EMF radiation exposure in your life! I hope you found my article: “Anti Radiation Blankets – A Buyer’s Guide” helpful, if you did, please consider sharing it! Sleeping Near An Electrical Panel – Is It Dangerous? Thank you for your hard work! I know I’m not alone in being grateful ? Question: In a Lloyd Burrell Joe Darnell said that anti-radiation clothing and canopies etc should not be used because the electricity will run through you or on /along your skin and the opposite = you getting charged – could happen…. he also advises against “grounding products” for the same reason. What do you know about this potential issue?